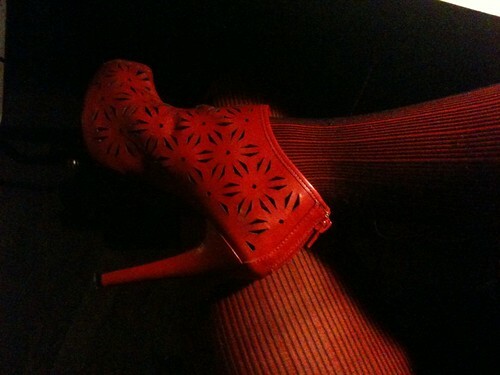 These red shoes are so silly. I fell over putting them on the other night. Falling down is so funny — I think it’s good to do every once in a while. It always reminds me of being a child — up one minute and down the next. These are cheap, pleathery heels that I’ve already messed up, alas. the documentary about Wal-Mart, and thinking I’d never shop there again. I broke that promise one late night when I was desperate to play Scrabble. know, I’m a giant nerd, hi.) Also, are you on Facebook? Thinking about quitting it? The other day, I was feeling blue. 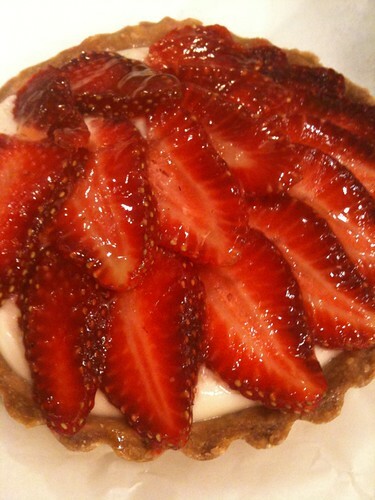 Then this strawberry tart happened to me! It came from Enoteca, the delicious bistro down the street from where I work. I’m pretty sure it had medicinal properties, or certainly magical powers. 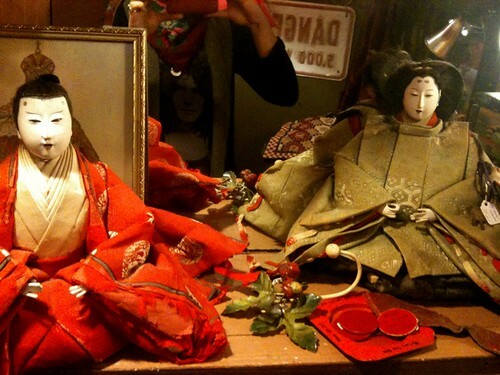 I love these Japanese dolls. I think their hair is human. Some of it is falling out. funny comments in white ink made me think I’d like her. Mystery people. It’s getting hot here, after a magically long and cool spring. cold air and made me remember what it’s like to feel chilly. 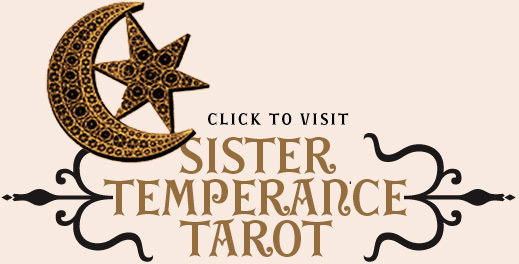 Smith tarot deck — the colors are brighter and richer, and more psychedelic! at it in wonder. I have a lot of useful objects that are too decorative to use. 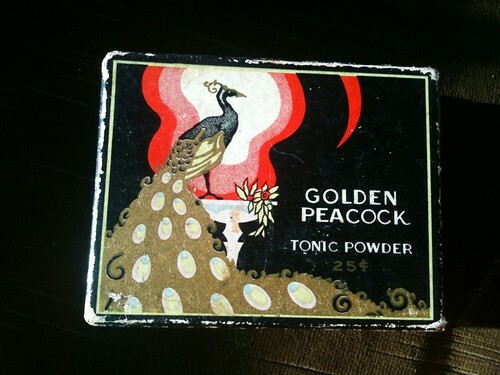 If this box of Golden Peacock Tonic Powder wasn’t empty, I think I’d use it! Soyons Descrets! 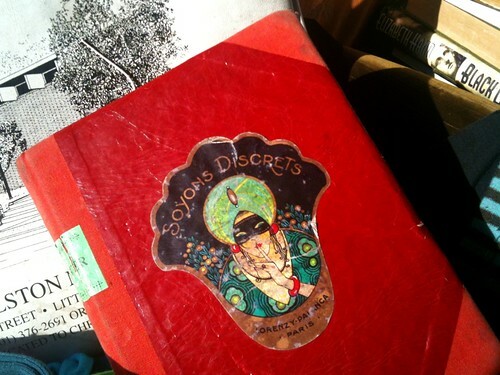 This is my paper journal — don’t you wish you could see inside? them all in the middle of the floor and then grabs some others at random to read. Just a quiet party where everyone reads everyone else’s diary. Is that weird? 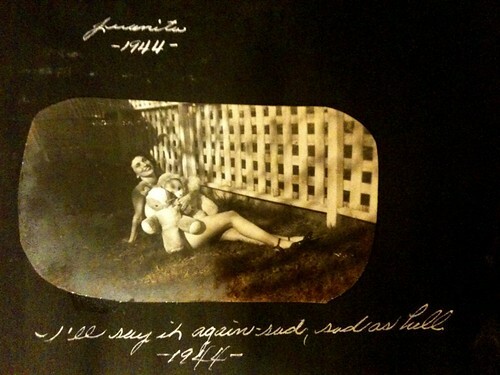 it in to Post Secret. I never have any good ones. No secrets keeps me light. I am overwhelmed with secrets. They make my stomach do flips. I doubt they’re worth of all the trouble they cause but if I say them out loud they cause tears to squeeze out of my eyes… and that’s really inconvenient. 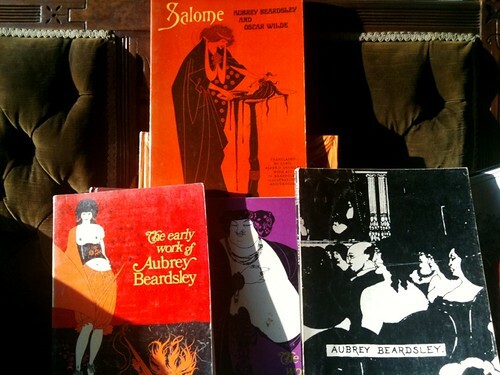 I love your collection of Beardsley books. I can’t imagine how you could have resisted them. Strawberries are my favorite thing every spring. I miss them when they aren’t in season. I never know whether I should address you as Angel or Angeliska. It causes me some distress sometimes. You could whisper your secrets into a hollow tree, maybe? Secrets are heavy to carry all alone! If I can ever help, please tell me. and introduce myself that way to make it easier for people. You can call me anything, as long as you don’t call me late for dinner! The diary thing sounds AWESOME. I would LOVE to do that. Why are you do far away! You are awesome. I saw someone with a Beardsley tattoo (of Salome and the head) the other day, it was AMAZING. Oh dear! At first I thought that the Beardsley collection was something being sold in your store, and I will confess I already had my credit card out of my wallet! The Ali Baba cover just cracks me up. And your paper journal is thrillingly beautiful – is that a Barbier illustration? I do think that is a lovely idea for a “share your secrets” type party – it is hard to tell, sometimes, what your friends and loved ones may be keeping to themselves for whatever reason – although I imagine the evening may be fraught with drama/trauma for some individuals, at the end of the night they(we) would probably feel amazingly connected and exhilarated. The diary party sounds fantastic! I would come, most definitely. Aha! More reasons to dislike f21! As if I was having trouble with that. I love the diary party idea. I wish I could go to one. A bar down the way from my house got closed down by a development project (nasty one too)and they used to have a night called Cringe Night where people would come with their journals and dramatically read them aloud to an audience…yep, CRINGE!!! 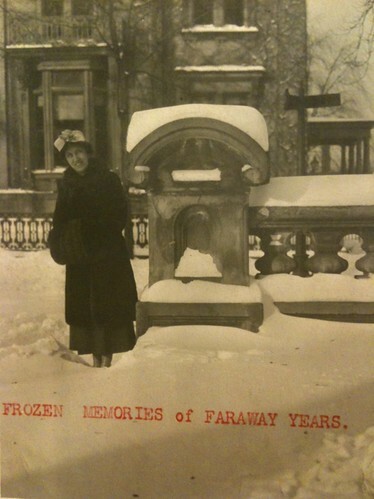 I see you’ve purchased some books in preparation for Aubrey and I’s whelping day (we are EXACTLY 100 years apart). Concerning consumerism, I try to by local as much as possible but, please you guys, where do you find locally made cheese graters and floor mats? Yep, it’s a conundrum. Wish I could make you a cake so you wouldn’t be blue for the whole summer. I haven’t kept a journal in so long…I wonder why. Hum! No secrets? I have plenty of beautiful old matchbooks, though. I did leave facebook.. and myspace before that. Now I am solely on LJ. I suppose the old way is better. I like being able to control who can find me, who can see me, etc. I guess I like being a secret. I love the shoes! Although the heel is a bit too high for me at my advanced age. I have a fit issue with “cheap” shoes and they rarely fit me comfortably or correctly so I’m not trying to be a snob when I say that I usually try to purchase shoes made in Spain, Italy or Portugal. Sometimes a Made In China shoe slips it’s way into the mix. Have you ever looked at office.co.uk? Great styles & not terribly expensive although shipping can be a killer. Oh, my dear. 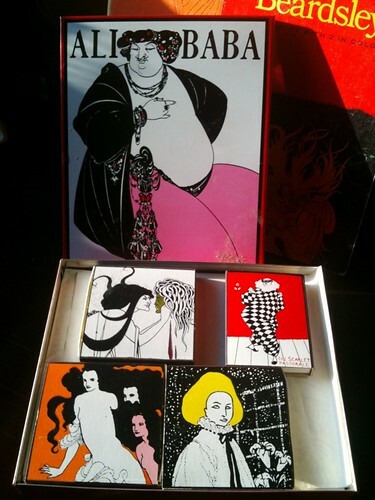 Lovely Beardsley, of course! I grapple with the whole fashion industry/consumer goods battle. I think basically we all pretty much live off of the backs of slaves- v. sad and horrible thing to say, I know. But when we think about it… if I go to Target to buy anything at all- it’s made in China. Well, I don’t suppose that folks in China get paid necessarily the amount that we are used to (ie at least min. wage.) I’m lower US income- most of my friends are the same- if we need something, we buy at Target, Walmart, discount stores, etc. If I look at most of my kitchen appliances, for instance- I’m looking at pieces made by people in basically slave-wage situations. The only solution to this, that I can see- is to buy used. So, thrifting is a very good option that I try to exercise- recycle, reuse! It doesn’t solve the problem of people getting paid less than they are worth- but one step at a time. I love well-made items too.. why buy cheap & sloppy when you can buy something well-made that will last a thousand lifetimes! Sometimes I shop for cheap things, but I do it at fleamarkets & second hands. I try not to buy a) too much plastic stuff (how can we possibly whine about oil drilling when we actually spend our days using products & packaging materials that are all made of oil – all these little things will form giant floating masses of plastic dust in the oceans, lakes = ecosystem) b) too much sweatshop stuff, which is practically everywhere. I boycott almost everything, but I guess it’s just because I don’t like most modern-day stuff, err..
Oh my god, I probably come across rather annoying and idealistic. I’m not so hysterical about this really.. and I do eat meat. I’ve never been a member in Facebook – I’ve always thought it’s kinda suspicious and weird.